GLOVERSVILLE-Thanks to a public-private partnership blooming between the city and the board of the Regional Animal Shelter, the city’s unfinished animal holding facility may be completed. Officials have set a target date of completion for July 1, in time to have an open house during Railfest. 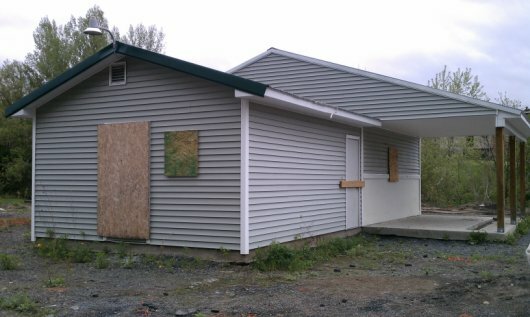 An anonymous $20,000 donation in May 2007 along with a $10,000 match by city taxpayers paid for construction of the structure, which now remains a 16-by-36-foot unfinished shell south of the Gloversville Transit Building. The boarded up property on West Fulton Street. In July 2010, city officials said another $10,000 to $15,000 was needed to complete plumbing, heating and other necessities for the building, where the city could bring animals picked up by the dog-control officer. Regional Animal Shelter President Debby Hupkes said 4th Ward Councilwoman Ellen Anadio contacted the shelter group. From there, Anadio and Councilman-at-Large James Robinson attended a board meeting to talk about the idea of the Regional Animal Shelter and the city working together to finish the building. The group’s board decided to help finish the shelter and then run it. The group is gathering donations to finish the project and may cover leftover costs. “It’s a public-private partnership and it’s a win-win for the city of Gloversville and our shelter,” Hupkes said. The board was formed about nine years ago. The group purchased 26 acres on Maple Avenue in Johnstown to build a $250,000 shelter. Hupkes said the group will continue with its fundraising and building the new shelter while possibly using the Gloversville location as an “interim” site untilthe new shelter is built and an “annex” after the new shelter is built. She said part of the agreement will be working out how staffing and by whom the utilities are paid as well as ownership. Anadio said Robinson and 3rd Ward Councilman Don Ambrosino, both electricians, have offered their services at no charge. She said she also knows a plumber who will help and has already been able to get some other items donated. Hupkes said attorney Ron Schur donated his services to draw up the contract. Amanda Whistle covers Gloversville news. She can be reached at gloversville@leaderherald.com.